Continuing the line of mystery figures that made their debut in 2014, 2015 Funko Sci-Fi Mystery Minis Series 2 again features a wide mix of well-known characters that fall into the science fiction genre. Covering a large variety of movies and television shows, the Sci-Fi lineup includes Bender from Futurama, Captain Kirk from Star Trek, Dr. Emmett Brown from Back to the Future and even Godzilla. 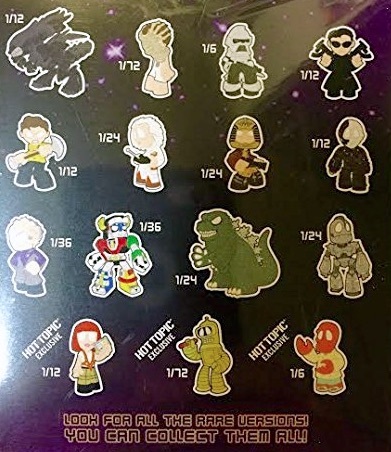 The main checklist includes a total of 15 figures in the full set and a Hot Topic version adds three exclusive options, including variants for Leeloo and Bender as well as a figure for Zoidberg. Full Hot Topic box odds are shown below and the main box odds are available with the full checklist at the bottom of the page. 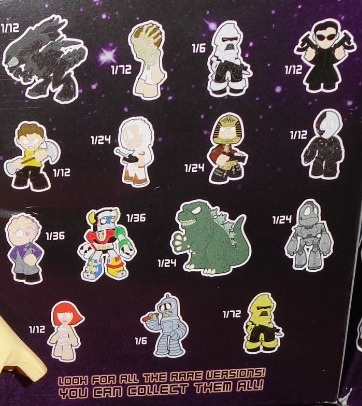 Packaged in a blind-box format, the actual figures in each box are intended to be a secret until they are opened by the consumer. Adding to the mystery, the figures have varying odds. While some fall more commonly, others average as little as 1:6 cases. Cases come with 12 individual blind boxes, so the 18-figure set is no small task. Box odds are listed for each character and exclusives are noted. Shop for Funko Sci-Fi Mystery Minis Series 2 figures on eBay.